Add a glamorous edge to your style with this stunning ladies' watch from Sekonda. This beautiful dress watch features a matt rose coloured dial set within a rose gold plated stone set case that oozes sophisticated sparkle. Finished with an elegant swirl design bracelet set in stainless steel and rose gold plating finished with shimmering stone set detailing. 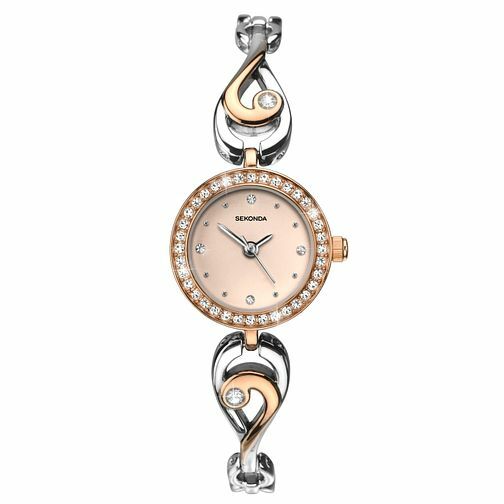 Sekonda Ladies' Two Tone Stone Set Swirl Bracelet Watch is rated 4.3 out of 5 by 4. Rated 5 out of 5 by Anonymous from Perfect fit As my mum has small wrists it is not easy to get one that suits, but this watch was perfect. Had to have links removed which was done in store and the lady made sure my mum left comfortable with the alteration made. Couldn’t be more happier with the final result.